Orthodox Church liturgical Bishop clergy vestments (violet-gold) by Istok Church Supplies Corp.
A Bishop occupies the highest spiritual office in a diocese and serves as a representative of Christ. He has the important role of maintaining unity and continuity of the Orthodox Christian church. 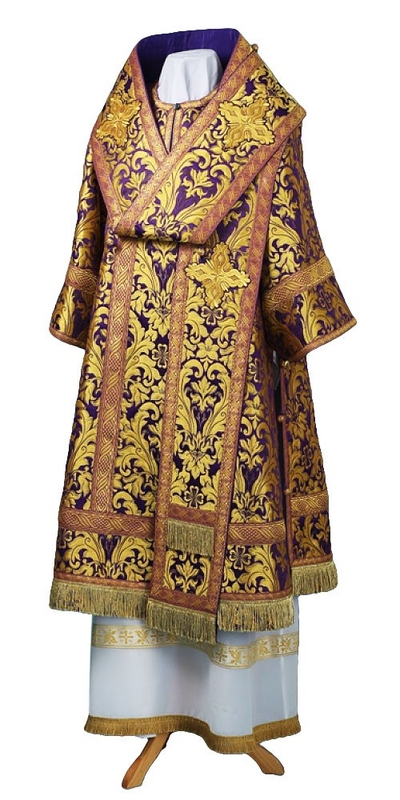 Istok Church Supplies has a wonderful collection of Bishop Vestments in violet and gold to help Bishops look distinguished and sophisticated while carrying out their ecclesiastical duties. Violet and gold is a classic color combination, conveying authority and supremacy. Bishop vestments in violet and gold are often worn during the Lenten period and the Dormition fast, especially for feasts and days that commemorate Cross of our Lord. The Bishop vestments we offer are available in three material choices – brocade with rayon jacquard, brocade with metallic jacquard and natural German velvet. No matter which fabric you choose, you can rest assured that it will be smooth and long lasting. We aim to provide our customers with best choices and options so that they can procure Bishop Vestments according to their aesthetic preferences, church needs and budget constraints. Customers who would like a vestment in a different fabric belonging the same class can send in a request via the Notes section during checkout. All our Bishop vestments are full sets and include individual items including alb, zone, palitsa, epitralhilion, epimanika, sulok, small omophorion and large omophorion. Customers can add matching chalice covers and a veil to their orders if they require them. Customers also have the option of adding an embroidered icon for the back. Decoration adds beauty to a liturgical garment. Customers can select from three distinct types of decoration – standard, premier and luxury - depending on whether they’re looking for inexpensive and simple decoration or more ornate trimmings. We specialize in providing one of a kind, individually sized and custom tailored vestments rendered by our master tailors based in Europe. Each one of our Bishop vestments in violet and gold is made in accordance with ancient traditions and canons. Please send us your individual measurements according to our measurement chart so that we can provide you with top quality Bishop Vestments that fit flawlessly.